Are Boiled Eggs Healthy? Why? Why Are Boiled Eggs Healthy? Many people ask, "Are boiled eggs healthy?" The simple answer is, "Yes, they are". That's mainly because a boiled egg that may look small is loaded with essential vitamins and minerals, such as iron, potassium, folate, vitamin E, and zinc. A hard-boiled egg is even better, especially considering the fact that it contains 6.29g of protein and only 78 calories. It can be a great way to refuel your body while keeping your calorie-intake low. The nutritional value of a hard-boiled egg makes it a great choice for a snack or as part of a breakfast. Still, the question is, "Are boiled eggs good for you in every situation?" Keep reading to learn more about it. If you ask, "Are hard-boiled eggs healthy?" the simple answer is again, "yes, they are healthy because they have essential nutrients". You may also want to eat boiled eggs because of the benefits of eggs. Hard-boiled eggs are loaded with good fats called polyunsaturated and monounsaturated fats. You need to ensure that you reduce your intake of saturated and Trans fats and eat more of good fats. This will help a lot in stabilizing your blood cholesterol levels and reduce your risk of heart disease. The fat will also regulate your blood sugar levels – that's why hard-boiled eggs are beneficial for people with type-2 diabetes. Hard-boiled eggs are a great source of protein – a large hard-boiled egg has 6g of protein. Your body needs protein not only to build muscles but also to repair tissues in your body. You should ensure that your diet consists of 10-35% protein – it should be up to 175g if you're following a 2000-calorie diet. Hard-boiled eggs are a great source of phytonutrient choline and essential minerals, including selenium and phosphorus. Your body needs selenium for proper enzyme functioning, which in turn activates specific enzymes needed to regulate thyroid function. Phosphorus is important for cell structures, including your genetic information and cell membranes. Similarly, choline is extremely important for proper brain function. A large hard-boiled egg will provide your body with 15 micrograms of selenium and 86mg of phosphorus. It also contains 147mg of choline – the recommended amount of choline is 550mg for men and 425mg for women. Are boiled eggs good for you? Yes, they are because they contain essential vitamins. 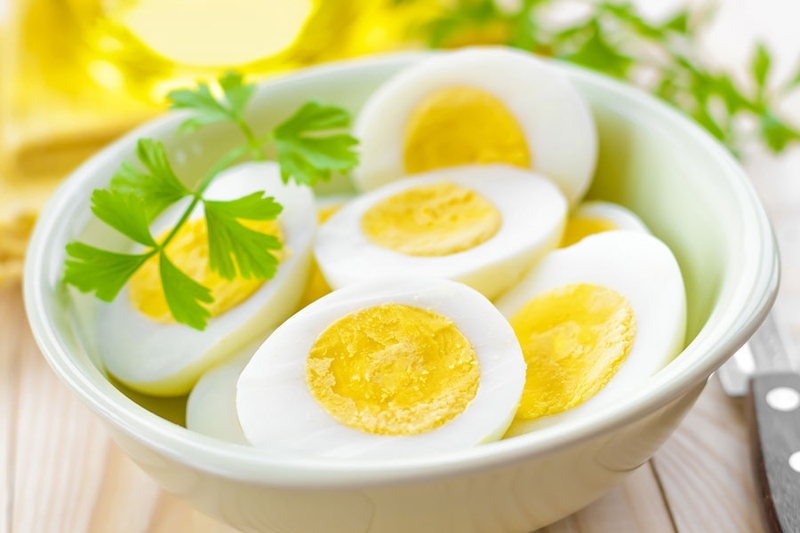 A hard-boiled egg will also provide your body with numerous vitamins, including vitamin B-5 and vitamin A. You need vitamin A for strong skin, healthy vision and a robust immune system. Similarly, vitamin B-5 is important for the health of your adrenal gland, which in turn helps your body produce red blood cells. A large boiled egg contains 0.7mg of vitamin B-5 and 260 units of vitamin A. It means that a large egg will provide you with 14% of your daily requirement of vitamin B-5 and 11% of recommended daily intake of vitamin A. Take a large egg and place it at the bottom of a saucepan. Make sure to cover it with cold water. Set the stove at high heat and let the water come to a full rolling boil. Turn off the heat but don't remove the pan. Cover it and leave for 10 minutes. It usually take 10 minutes before you have a perfectly boiled egg, but it may also depend on how cooked you like your eggs. It may also take some more time depending on the shape of your pan, your altitude, the ratio of water to egg and the size of the egg. If you're cooking a large number of eggs together, it is always a good idea to sacrifice an egg and check it for doneness. Strain out the water from your saucepan and place your hard-boiled egg under cold water. This will cool it off and stop it from cooking any further. It is a good idea to peel the egg under running water. It may seem simple, but not everyone can cook a perfectly boiled egg. It is so easy to boil an egg that's too rubbery, too hard to peel, too ugly, or too exploding-from-the shell. Here are few tips that will help you achieve your goal efficiently. Don't actually boil them: This may be a bit confusing, but you should pay attention to this point and use simmering water only or else you will have stiff, rubbery whites. Use a timer: It usually takes 10 minutes to have your boiled-eggs ready, but again, it may depend on some other factors like mentioned already. Once you know how long it takes to cook perfect eggs, use a time and stick to the cooking time. Wait before you cook: Don't use fresh eggs for cooking. It will be difficult to peel fresh eggs. You will be better of leaving fresh eggs in your refrigerator for a few days before cooking. This will save you from the hassle of dealing with whites sticking to the shell. Server responsed at: 04/21/2019 11:03 p.m.